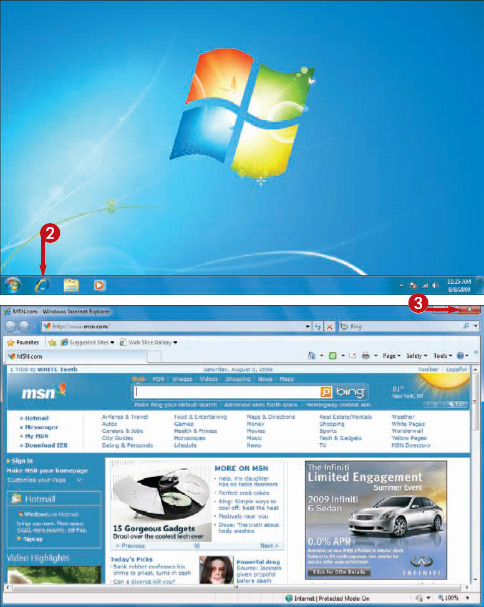 You can use Internet Explorer, Windows 7's built-in Web browser program, to surf the Web. To do this, you must first start Internet Explorer. When you have completed your work on the Web, you should shut down Internet Explorer to reduce clutter on your screen and recover some system resources. Some versions of Windows 7, particularly those sold in the European Union, do not include the Internet Explorer Web browser. To obtain Internet Explorer, contact your computer manufacturer or Microsoft. 1 Connect to the Internet. If you do not see the Internet Explorer icon in the taskbar, click Start, click All Programs, and then click Internet Explorer. The Internet Explorer window appears. If you see the Welcome to Internet Explorer 8 dialog box, click Next, click Use express settings ( changes to ), and then click Finish. 3 When you are finished with the Web, click the Close button ( ) to shut down Internet Explorer. If your computer is running Windows, then your default Web browser is most likely Internet Explorer. This is Microsoft's browser, and it comes with most versions of Windows, which is part of the reason why it is the most popular browser in use today. This section introduces you to the main features of the Internet Explorer window. You can more easily surf the Web if you know your way around the Internet Explorer Web browser. 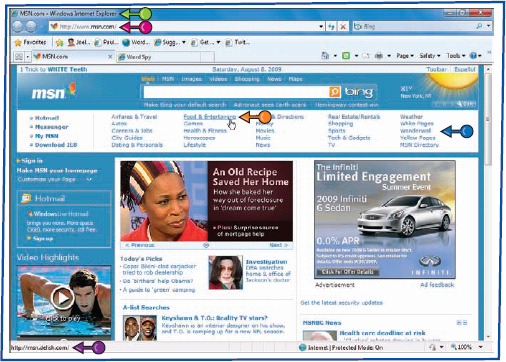 This part of the Internet Explorer title bar displays the title of the displayed Web page. This text box displays the address of the displayed Web page. You can also use the address bar to type the address of a Web page that you want to visit. Links appear either as text or as images. On most pages (although not the page shown here), text links appear underlined and in a different color (usually blue) than the regular page text. This is the link that you are currently pointing at with your mouse. The mouse pointer changes from to . On some pages, the link text also becomes underlined (as shown here) and changes color. This area displays the current status of Internet Explorer. For example, it displays "Opening page" when you are downloading a Web page, and "Done" when the page is fully loaded. When you point at a link, the status bar displays the address of the page associated with the link.